Infared imagery of Irma at 6:40 PM CST on Friday, Sept 8 2017. 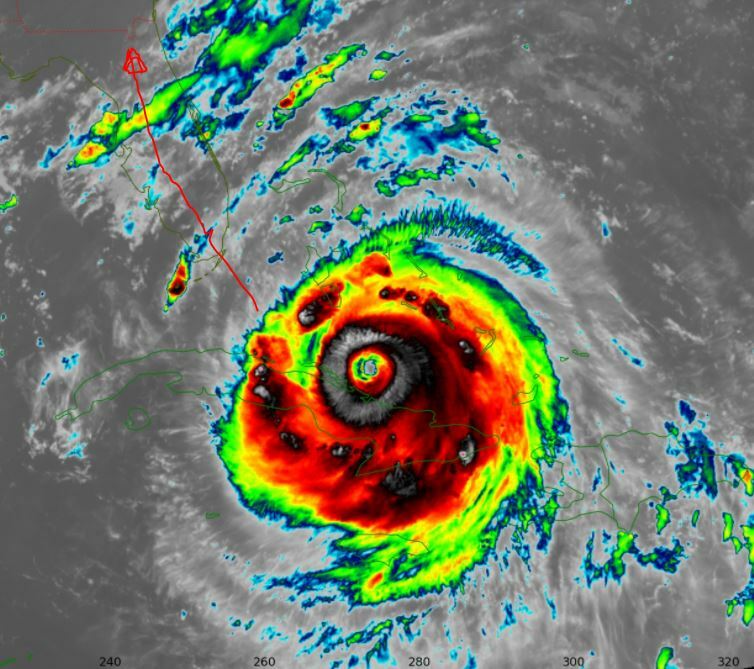 Hurricane Irma quickly intensified to Cat. 5 Major status earlier this week west of the Caribbean. Measured wind gusts of 185 MPH made it one of the top five strongest Atlantic/Gulf hurricanes measured in recent history. Since peaking earlier this week it has been on a gradual & subtle decline in intensity; but still remains a major hurricane. Irma is currently rated Cat. 4 with measured wind gusts estimated at 135kt (155 MPH) per the 5:00PM update. Storm surge for 5-10 ft expected across the southern third of Florida. 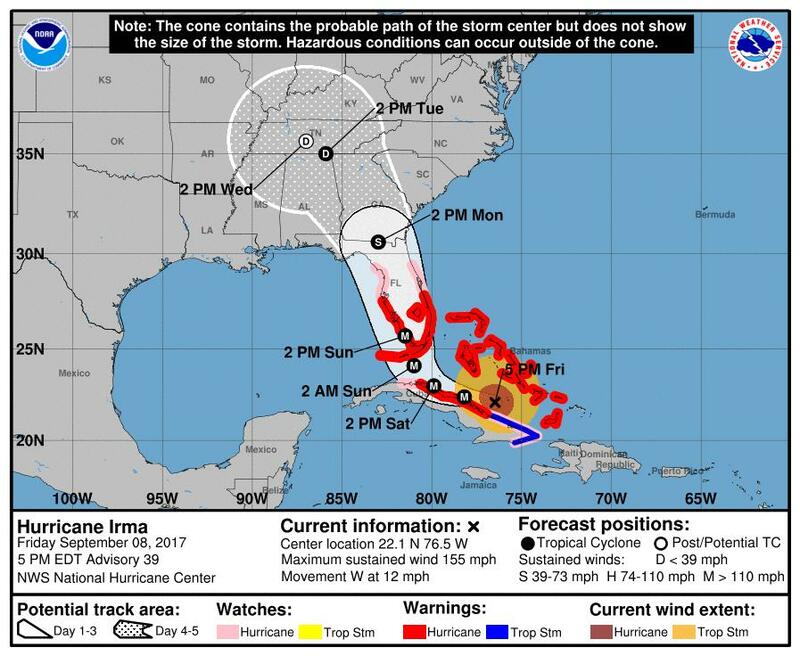 Landfall in the Florida keys is expected early Sunday morning. The storm will travel north through the day across the Peninsula. Maximum wind gusts at landfall of 155 - 160 MPH according to the NHC. This will be a serious and disruptive event for the state of Florida. Hurricane force winds are possible across the entire peninsula. With wind damage expected in both coastal and inland areas. Coastal areas will see the worst of the storm with inland areas *somewhat helped* by drag (trees, buildings, etc.). National Hurricane Center forecast position and max wind gusts. Forecasting 160MPH max gusts just before landfall at the southern tip of Florida. Once the hurricane eye comes onshore it will weaken quickly. By the time it reaches the northern half of Florida it will be a shell of it's previous-self, though still potent and dangerous. Perspective: This figures to be the strongest hurricane in Florida since Charley (2004), but not the same intensity as Dennis(1992) (yet). In conclusion it should be treated like a major hurricane. Check out this list of major hurricanes in history. Image via the National Hurricane Center. Expect minor shifts in the storm track over the next day. Be careful of major news networks who just want to get you worked up. Stick with the National Hurricane Center for the best information. Major hurricanes will do what major hurricanes have always done so make sure family in the area is aware. The Weather Channel, WeatherNation typically have great coverage of hurricanes (it's what they do). If you have family in the area, give them a call and hear what their plans are. We will not be updating this article but hopefully this gets you up to speed.